Humulus lupulus is a plant originally native to Europe and Western Asia. However, due to its importance in beer making, its cultivation has spread into the Americas (N. and S.), Asia, Africa, and Australia. Hops grow well in temperate climates ranging between latitudes 30o- 50o on both sides of the equator, as seen above with the number of continents it has spread to! It can also grow in altitudes from 0 – 8500 ft. They need an average annual rainfall of 30 cm (can and mostly does come from irrigation), 4.5 to 8.2 pH in the soil, and temperatures from 5.6 to 21.3 oC (42- 70 oF respectively). 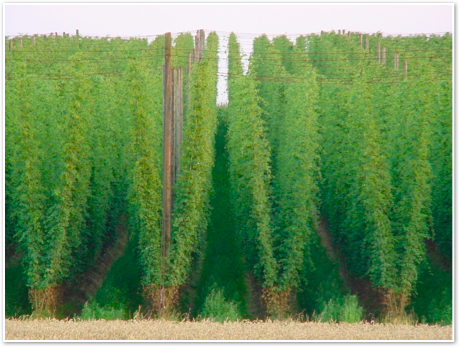 Hops grow well in many soils given they are fertile, can hold moisture, but also drains well. Soils composed of sand, silt, clay, and organic matter, often called a loam, mixed roughly equally work very well for growth of hops. H. lupulus needs a good amount of sun to sustain growth. Even though it can be grown in partial shade, long, sunny summer days are needed for the crop to flower and produce high yields. H. lupulus is a perennial herbaceous plant, meaning it lives for several growing seasons, some where around 10-20 years, and does not exhibit much secondary growth. This is grow to the girth of the plant. H. lupulus starts growth in spring, thrives in summer, and is harvested in fall (early August). Each winter, the plant is cut back to its rootstock, or rhizome, and a waits spring. In spring, the root stock starts to grow back in the usual vine like structure. The vine is trained each year to grow onto a wire trellis frame. (Fig. 3) H. lupulus uses strong hairs to grasp the wire and twine around it. 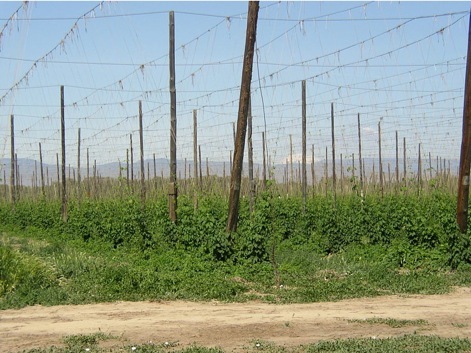 Although dependent on variety, the hop plant can grow as high as sixteen feet tall on these trellis frameworks! Several diseases and pests can affect H. lupulus, some being downy mildew, mold, damson-hop aphids, and Verticillium wilt. Since the hop plant has been cultivated for many centuries, many varieties and breeds have been breed to be resistant to diseases and pests. However, pesticides are still applied due to the delicateness of the crop, the need for higher yields, and the fear of spreading unwanted organisms. Some brewers distrust the use of pesticides, feeling they change the taste and characteristics of the hops, but not much can be done otherwise. It would be very hard to keep up with demand with out the use of them.